The prostaglandin D2 receptor DP2 has been implicated in eosinophil infiltration and the development of eosinophilic esophagitis (EoE). In this study, we investigated an involvement of PGE2 (EP1–EP4) and PGD2 (DP1) receptors in EoE by measuring their expression in peripheral blood eosinophils and esophageal mucosal biopsies of EoE patients and by performing migration and adhesion assays with eosinophils from healthy donors. Expression of EP2 and EP4, but not EP1 and EP3, was decreased in blood eosinophils of patients with EoE vs. control subjects. 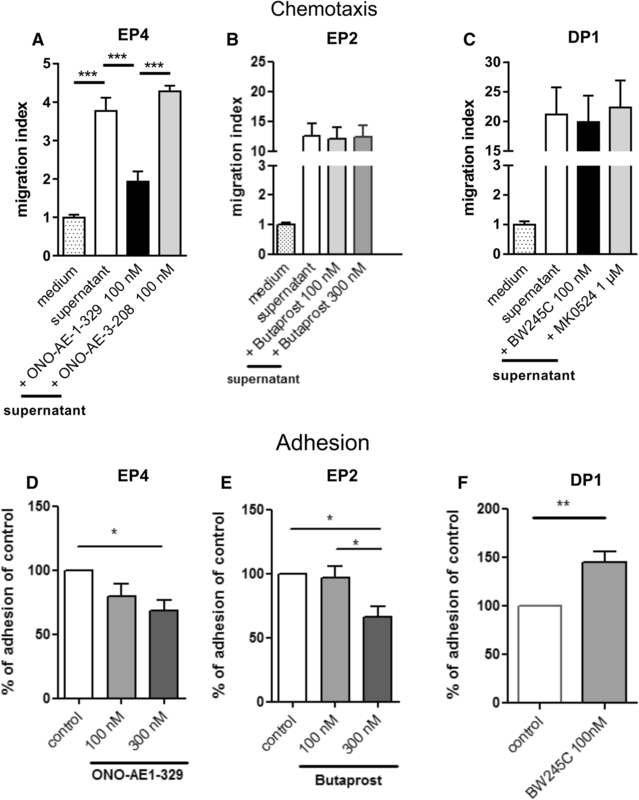 Adhesion of eosinophils to esophageal epithelial cells was decreased by EP2 receptor agonist butaprost and EP4 agonist ONO-AE1-329, whereas DP1 agonist BW245C increased adhesion. In chemotaxis assays with supernatant from human esophageal epithelial cells, only ONO-AE1-329 but not butaprost or BW245C inhibited the migration of eosinophils. 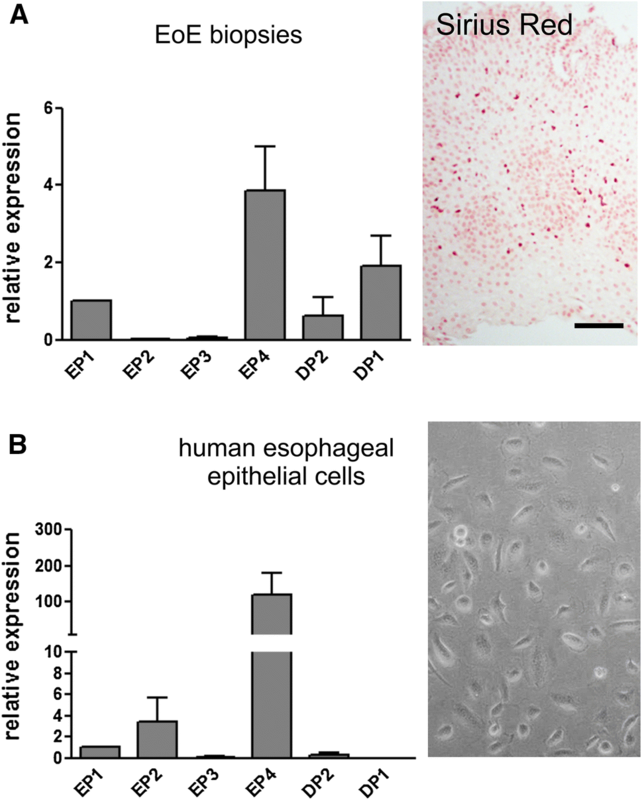 Expression of EP and DP receptors in epithelial cells and eosinophils was detected in sections of esophageal biopsies from EoE patients by immunohistochemistry. qPCR of biopsies from EoE patients revealed that gene expression of EP4 and DP1 was the highest among PGE2 and PGD2 receptors. Esophageal epithelial cells in culture showed high gene expression for EP2 and EP4. Activation of EP2 and EP4 receptors decreased barrier integrity of esophageal epithelial cells in impedance assays. Activation of EP2 and EP4 receptors may inhibit eosinophil recruitment to the esophageal mucosa. However, their activation could negatively affect esophageal barrier integrity suggesting that eosinophilic rather than epithelial EP2 and EP4 have a protective role in EoE. EoE is an inflammatory and antigen-driven disorder of the esophagus . Histologically, it is characterized by eosinophil infiltration into the esophageal mucosa and diagnosed when more than 15 eosinophils per high powered field are present in biopsies [2, 3]. Clinically, EoE is accompanied by dysphagia, food impaction, and intractable dyspepsia that is partially responsive to treatment with proton pump inhibitors [2, 3, 4]. In the long term, fibrosis of the lamina propria and remodeling of the esophagus occurs, leading to a narrowing of the esophagus lumen and stricture formation . The pathophysiology of many features of EoE, including the infiltration of eosinophils into the esophageal mucosa, is still unclear. Prostaglandin (PG) D2 and E2 receptors have been linked to eosinophilic airway disorders such as asthma, non-asthmatic eosinophilic bronchitis [6, 7], and allergic rhinitis  indicating a potential role in the development of eosinophil-driven diseases. In addition, treatment with a PGD2 receptor antagonist previously revealed a benefit in a small group of EoE patients  suggesting that PGD2 and PGE2 receptors may be also involved in the development of EoE. PGD2 is an important mediator in inflammatory reactions with either pro- or anti-inflammatory effects . Which of the effects occurs depends on the type, activation state, interaction, tissue, and cellular presence of the PGD2 receptors involved . PGD2 receptors comprise two G protein-coupled receptors, namely D-type prostanoid receptor 1 (DP1) and 2 (DP2) (formerly CRTH2). DP1 is located on many types of leukocytes including dendritic cells, lymphocytes, neutrophils, and eosinophils [7, 11], and it conveys anti-inflammatory actions in models of gastrointestinal (GI) inflammation [12, 13], while DP2 is mainly located on Th2 cells, eosinophils, basophils, and monocytes . Opposite to DP1, DP2 plays a proinflammatory role in GI inflammation . The two receptors have been shown to cooperate in trafficking and chemotaxis of eosinophils . In contrast to PGD2, PGE2 acts via four G protein-coupled receptors (EP1-EP4) with different signal transduction pathways, tissue localization, and regulation of expression . Different receptors and divers signaling options for one mediator explain why PGE2, similar to PGD2, is able to exert proinflammatory as well as anti-inflammatory effects . Flow cytometric data suggest that all types of EP receptors are present in human eosinophils [16, 17, 18]; however, EP receptors have also been found in esophageal epithelial cells . In GI inflammation, PGE2 can either increase  or diminish inflammatory processes . EP2 and, in particular, EP4 have been shown to mediate PGE2-induced anti-migratory effects in eosinophils [16, 17, 18]. Based on the recent findings that a DP2 antagonist inhibited eosinophil infiltration into the esophageal mucosa in animals and humans and ameliorated disease symptoms [9, 22], we explored whether EP1, EP2, EP3, and EP4 as well as DP1 play a role in EoE by assessing the presence of these receptors in blood eosinophils of EoE patients in comparison with controls and by measuring gene expression of the receptors in esophageal mucosal biopsies of EoE patients. Since infiltration of eosinophils into esophageal mucosa represents a major feature of EoE, we performed chemotaxis and adhesion assays with eosinophils from healthy donors and primary esophageal epithelial cells. 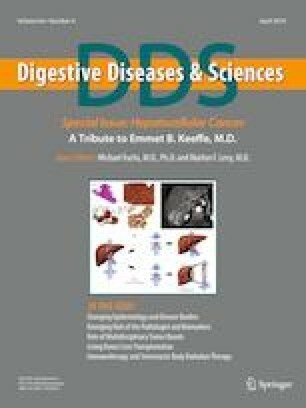 Ten patients with clinically, endoscopically, and histologically confirmed EoE (46.7 ± 13.7 [mean age ± SD]; 7 males/3 females), and eight healthy control subjects (33 ± 13; 3 males/5 females) were included in the study. Diagnosis of EoE was established by clinical, endoscopic, and histological criteria. Conditions and criteria of diagnosis followed the recommendations according to the current published guidelines . From EoE patients, blood and esophageal mucosal biopsies (from the proximal and distal part of the esophagus) were collected (see Table 1 for patient characteristics). From healthy control subjects, only blood was collected. EoE patients were recruited from the Department of Internal Medicine, and healthy volunteers were recruited from the Division of Pharmacology at the Medical University of Graz. Eosinophils isolated from healthy volunteers served as controls for flow cytometry experiments and for migration and adhesion assays. Subjects with significant comorbidities, intercurrent illness (such as infections), and pregnant women were excluded from the study. Blood was collected in Vacuette® EDTA blood tubes (Greiner-Bio-One, Austria) and immediately processed for flow cytometric experiments. Collected biopsies were immediately frozen (two/patient) or fixed (two/patient) in 10% phosphate-buffered formalin for histochemical analysis. Two subjects of the EoE cohort were on proton pump inhibitors at the time of blood collection, while subjects who had biopsies taken were on no therapy at the time of collection (see EoE patient characteristics in Table 1). Human primary esophageal epithelial cells were purchased from Cell Biologics (Chicago, IL, USA; Cat.# H-6046), cultivated in complete human epithelial cell medium provided by the vendor and used until passage seven. Whole blood from EoE patients or healthy individuals was lysed with 1x BD FACS lysing solution to remove erythrocytes. Samples were washed once in PBS, resuspended in fixative solution, and kept on ice for 10 min. After washing with PBS, cells were blocked with Ultra-V Block (Lonza; Allendale, NJ, USA) for 30 min at 4 °C. For flow cytometric visualization of the DP1 receptor, cells were incubated with mouse polyclonal antibody against DP1 (20 μg/ml; Sigma-Aldrich, St. Louis, MO, USA), or normal mouse IgG (20 μg/ml; Sigma-Aldrich) for 30 min at 4 °C. For flow cytometric visualization of the DP2 receptor, cells were stained with Alexa Fluor 647-conjugated rat anti-human DP2 antibody or Alexa Fluor 647-conjugated rat IgG2a isotype control (10 μg/ml; BD Biosciences; San Jose, CA, USA) for 30 min at 4 °C. Cells were washed in PBS, resuspended in antibody Diluent (Dako, Glostrup, Denmark) and incubated for 30 min at 4 °C with the secondary antibody (1:2000; Alexa Fluor 488-conjugated rabbit anti-mouse secondary antibody; Life Technologies, Carlsbad, CA, USA). For flow cytometric visualization of the EP receptors, cells were incubated with rabbit polyclonal antibodies against EP1, EP2, and EP3 (20 μg/ml; Alomone Labs, Jerusalem, Israel) and mouse polyclonal antibody against EP4 (20 μg/ml; Alomone Labs, Jerusalem, Israel), or normal rabbit or mouse IgG (20 μg/ml; Santa Cruz Biotechnology, Dallas, TX, USA) for 30 min at 4 °C. Cells were washed in PBS, resuspended in antibody Diluent (Dako, Glostrup, Denmark), and incubated for 30 min at 4 °C with the secondary antibody (1:2000; PE-conjugated goat anti-rabbit or rabbit anti-mouse secondary antibody; Life Technologies, Carlsbad, CA, USA). Finally, all samples were washed with PBS, fixative solution was added, and samples were kept on ice until analyzed on a FACSCanto II flow cytometer. Eosinophils were identified on the basis of forward versus side scatter parameters and autofluorescence. Receptor expression was recorded as mean fluorescence intensity and expressed as fold increase over isotype control signals. Migration assays were performed with peripheral blood eosinophils in 96-well Transwell plates with 5-µm membrane inserts (Corning Inc., Lowell, MA, USA). Eosinophils from healthy donors were incubated with the following compounds: EP4 agonist ONO-AE1-329 (100 nM) or EP4 antagonist ONO-AE3-208 (100 nM; ONO compounds were a generous gift from ONO Pharmaceutical, Osaka, Japan), EP2 agonist butaprost (100 and 300 nM; Cayman Chemicals, Ann Arbor, MI, USA), DP1 agonist BW245C (100 nM), and DP1 antagonist MK0524 (1 µM; Cayman Chemicals). Thereafter, a suspension of 5 × 104 eosinophils was placed in the upper well. Supernatant from the esophageal epithelial cell culture was added into the bottom well as a chemoattractant. Eosinophils were allowed to migrate for 1 h at 37 °C and 5% CO2 in a humidified incubator and evaluated by flow cytometry. Each migration experiment was performed in triplicates. The average number of migrated cells was determined from at least five independent experiments. Human esophageal epithelial cells were seeded in black wall clear bottom 96-well plates and allowed to adhere for 48 h prior to each experiment. The cell monolayers were then starved in incomplete human epithelial cell medium + 2% FBS for 1 h and subsequently treated with TNF-α (10 ng/ml) for 4 h. Eosinophils were incubated with 100 and 300 nM of the EP4 agonist ONO AE1-329, the EP2 agonist butaprost, and with 100 nM of the DP1 agonist BW245 for 1 h. Eosinophils were afterward washed once and loaded with calcein-AM (1:1000) in incomplete human epithelial cell medium + 2% FBS for 30 min at 37 °C in the dark. After two additional washing steps, eosinophils were added to the esophageal epithelial cell monolayer and incubated for 30 min at 37 °C. After a wash with HBSS, signals of adherent eosinophils were measured on a FLEX station II. Data were measured as relative fluorescence units (RFUs) and expressed as % of adhesion of control (untreated eosinophils). Electric cell-substrate impedance sensing (ECIS®, Applied Biophysics, Troy, NY, USA) with gold electrode arrays of the type 8W10E + was used to monitor the integrity of esophageal epithelial cell monolayers at real time in vitro as previously described . ECIS® array wells were activated with l-cysteine (10 mM) and precoated with 1% gelatine for 30 min at 37 °C. Then, wells were allowed to equilibrate with 200 µL cell medium for 15 min at 37 °C before esophageal epithelial cells were added in additional 200 µL medium to each well (1.5 × 105 cells/well). Monolayer formation was followed by impedance measurements. Cells were treated with either 100 or 300 nM of EP4 agonist ONO-AE1-329 or EP2 agonist butaprost. Data are expressed as normalized resistance over time. RNA isolation, reverse transcription (RT-PCR) and quantitative real-time PCR (qPCR) were performed as previously described  using primers for EP1, EP2, EP3, EP4, DP1, DP2, and β-actin (all from Bio-Rad; listed in Table 2). Relative gene expression was assessed according to the ΔΔCq method. Paraffin-embedded sections of biopsies from EoE patients (n = 3) were cut (5 µm) and deparaffinized. For immunohistochemistry, sections were microwaved for 2 × 5 min cycles in 10 mM citrate buffer, and processed by ABC method according to the manufacturer’s protocol (Vectastain ABC kit; Vector Laboratories, Burlingname, CA, USA). Sections were incubated with rabbit polyclonal antibodies against EP2 (1:500) (Alomone Labs, Jerusalem, Israel), EP4 (1:500), and DP1 (1:100) (Cayman Chemicals), visualized with 3-3′-diaminobenzidine (DAB) or Vector® ImmPact™ NovaRED HRP substrate kit according to the manufacturer’s protocol (Vector Laboratories), and counterstained with hematoxylin. As a negative control, primary antibodies were omitted during the staining procedure. Stainings were evaluated by two investigators. Images were taken with a high-resolution digital camera (Olympus UC 90) and analyzed by CellSense® standard 1.17 imaging software (Olympus, Vienna, Austria). Only contrast, brightness and color balance of images were adjusted. Sirius Red (Direct Red 80®, Sigma) was used to stain eosinophils in deparaffinized sections. Data are described as mean ± SEM (or otherwise stated) of at least n = 5 observations or otherwise stated. Statistical analyses were performed using one-way ANOVA followed by Tukey’s post hoc test, or by Student’s t test run on GraphPad Prism® software. p values of < 0.05 were considered significant. We first evaluated EP and DP receptor expression in peripheral blood eosinophils of EoE patients and healthy control subjects. We observed significant differences in EP2 (p = 0.0055) and EP4 (p = 0.0206) expression between EoE patients and control subjects but no changes in the expression levels of EP1 and EP3 (Fig. 1). Also, no differences were observed for DP1 and DP2 expression between EoE patients and control subjects (Fig. 1). Next, we tested whether EP2 and EP4 receptors influence the migration and adhesion capacity of eosinophils to human primary esophageal epithelial cells and their supernatant. To this end, eosinophils were incubated with 100 or 300 nM of the EP4 agonist ONO-AE1-329 or the EP4 antagonist ONO-AE3-208, with 100 and 300 nM of the EP2 agonist butaprost, and, since flow cytometry data suggested a slight increase in DP1 expression in the eosinophils (Fig. 1), with 100 nM of the DP1 agonist BW245C or 1 µM of DP1 antagonist MK0524. Using supernatant from human primary esophageal epithelial cells as a chemoattractant, only the EP4 agonist (Fig. 2a), but not the EP2 and DP1 agonists (Fig. 2b, c), had an effect on the chemotactic behavior of eosinophils. In adhesion assays, however, both the EP4 agonist ONO-AE1-329 (Fig. 2d) and EP2 agonist butaprost (Fig. 2e) dose-dependently decreased the adhesion of eosinophils to primary esophageal epithelial cells, whereas the DP1 agonist BW245 clearly enhanced eosinophil adhesion (Fig. 2f). Expression levels of EP and DP receptors were investigated by qPCR in esophageal mucosal biopsies and by immunohistochemistry in histological sections of esophageal mucosa from EoE patients. Among EP receptors, highest gene expression was observed for EP4, while expression levels of EP2 and EP3 were very low (Fig. 3a). qPCR in esophageal squamous epithelial cell cultures showed that gene expression of EP4 was the highest among EP receptors, while levels of DP1 and DP2 were extremely low (Fig. 3b), indicating that infiltrated rather than esophageal epithelial cells are responsible for the DP1 expression measured in mucosal biopsies from EoE patients (Fig. 3a). In accordance with these findings, we observed DP1 immunostaining in eosinophils (arrows) but hardly any in epithelial cells (Fig. 4a). EP4 immunostaining was present in eosinophils (Fig. 4b, arrow) but also in epithelial cells (Fig. 4b, arrowhead), confirming our qPCR data. Although EP2 transcripts are present in esophageal epithelial cells (Fig. 3b), they were barely detectable in the qPCR of EoE biopsies (Fig. 3a). However, EP2 immunostaining could be observed in eosinophils (Fig. 4c, arrows) and epithelial cells of EoE biopsies (Fig. 4c, arrowhead). Since EP receptors were also observed in esophageal epithelial cells (Figs. 3b, 4b and c), we investigated their functional implication by assessing their role in barrier integrity. We conducted ECIS® impedance assays in esophageal epithelial cells incubated with EP4 agonist ONO-AE1-329 (Fig. 5a; 10 and 300 nM) and EP2 agonist butaprost (Fig. 5b; 10 and 300 nM). A decrease in resistance correlates with a decrease in the monolayer’s integrity. As a result of the treatments, the EP4 agonist dose-dependently decreased resistance in comparison with vehicle (control) (Fig. 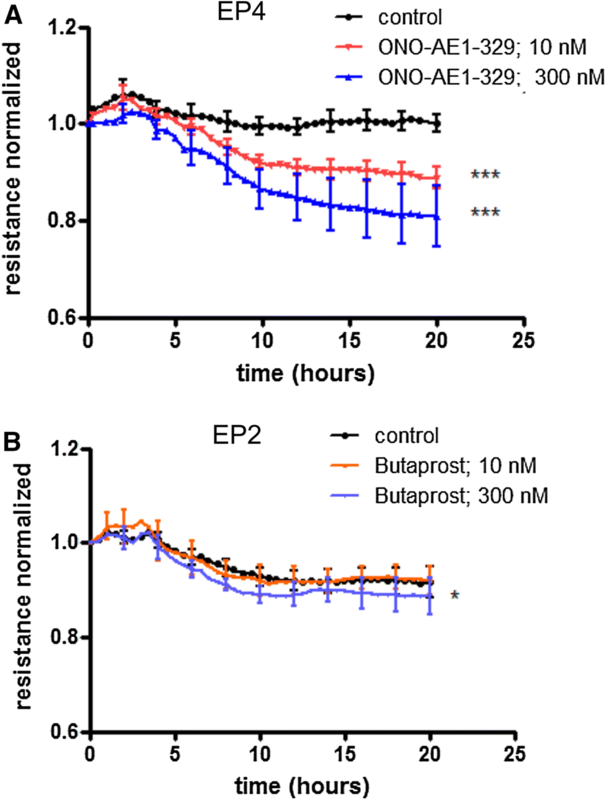 5a), while a decrease in resistance after incubation with the EP2 agonist was marginal though significant (Fig. 5b). EoE is an allergen-mediated eosinophilic inflammatory disease, and the increased number of eosinophils found in EoE biopsies is a determinant for the disease process . Receptors that regulate migration of eosinophils may, therefore, play an important role in EoE pathophysiology. EP and DP receptors represent such regulators, and they have been implicated in eosinophil trafficking in allergic lung disease [8, 26, 27] and skin inflammation . Here, we provide a first insight as to how EP receptors may impact the pathogenesis of EoE. The study has several limitations though. Since it is a pilot study, a low number of EoE patients was only included. Secondly, for the evaluations of biopsies, we only used material from EoE patients but not from healthy subjects. Finally, for migration and adhesion assays, eosinophils from EoE patients would have been desirable. 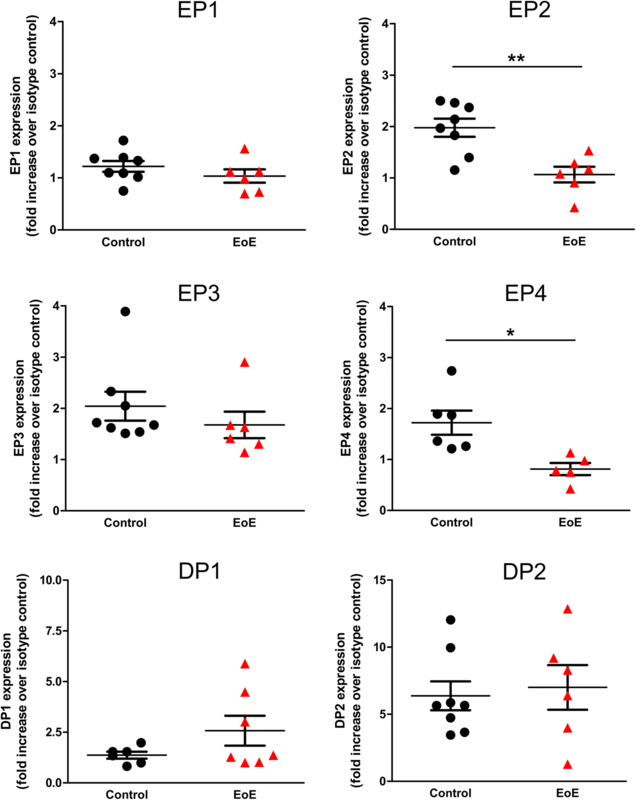 EP receptors have not yet been investigated in EoE peripheral blood eosinophils; however, two studies described increased expression of DP2 in EoE [29, 30]. Our findings indicate that surface expression of EP2 and EP4 was decreased in peripheral blood eosinophils of EoE patients, whereas expression of DP1 and DP2 was not different from control subjects, suggesting that, because of the anti-migratory capacity of EP4 and EP2 [16, 17, 18], eosinophils from EoE patients could have been more prone to infiltrate tissue. The activation of EP2 and EP4 diminished adhesion to epithelial cells and reduced, at least after EP4 agonism, chemotaxis toward esophageal epithelial cell supernatant, suggesting that particularly EP4 receptors may control the influx of eosinophils into esophageal mucosa. It is not quite clear why the EP2 agonist butaprost was not effective in inhibiting eosinophil migration toward supernatant although agonists of EP2 are able to inhibit eosinophil migration at similar concentrations . A possible explanation may be that the EP2 receptors became desensitized by PGE2 (or by a metabolite) that was present in the supernatant of esophageal epithelial cells which are known to express Cox-2 enzymes  and are, therefore, capable of producing prostaglandins. Nishigaki et al. already showed that EP2 and EP4 have different susceptibilities to PGE2 and its first metabolite 15-keto-PGE2 . EP4 and EP2 could have, therefore, exhibited agonist-induced desensitization of different magnitude in our experiments. Since the activation/blockade of DP1 did not change chemotactic behavior of eosinophils (despite the fact that DP1 agonism inhibits DP2-induced migration of eosinophils [11, 32]), a mechanism similar to EP2 may also apply for DP1. The histological hallmark of EoE diagnosis is characterized by eosinophils diffusely infiltrating the esophageal squamous epithelium (see Fig. 3a) . We were interested whether EP and DP receptors may influence adhesion of eosinophils to esophageal epithelial cells, as this process is crucial for inducing cell death or releasing soluble factors in the epithelium. For instance, CD11a/CD18-dependent adhesion of eosinophils to colon cancer cells is required for releasing cytotoxic mediators to induce apoptosis . In our experiments, agonists of EP4, EP2, and DP1 affected adhesion of eosinophils to esophageal mucosal cells in a differential manner. Therefore, endogenous PGs produced by epithelial cells, or by eosinophils and other infiltrated cells of the esophagus mucosa , may activate EP and DP receptors depending on time and site of release. The decreased adhesion of eosinophils by EP4 activation is in line with earlier work from our laboratory . In that study, EP4 agonists decreased the adhesion of eosinophils to vascular endothelium preventing the activation and cell-surface clustering of β2 integrins, and the L-selectin shedding of eosinophils . As our present study also shows a decreased adhesion after incubation with the EP2 agonist butaprost, different/additional adhesion molecules than those found on endothelial cells (such as E-selectin) are probably present on the esophageal epithelial cells . Molecular events in the esophageal epithelium, such as an imbalanced expression of proteases and protease inhibitors (e.g., SPINK7), have been recently reported to be critical for EoE pathophysiology [37, 38]. Thus, we performed barrier assays with esophageal epithelial cells. In agreement with another study [9, 19], we detected EP but hardly any DP expression in esophageal epithelial cells pointing at a role for EP rather than DP receptors in esophageal epithelial homeostasis. The role of EP receptors in the esophageal mucosa is still unknown, but, in general, eicosanoids and their receptors may not play the same protective role in the esophageal than the gastric mucosa . A biphasic effect for PGE2 that depends on the applied dosage has been described in a model of acid reflux esophagitis, suggesting a more complex function of EP receptors in the esophageal epithelium . We found that EP4 and EP2 activation may be even harmful to the epithelial barrier despite the finding that EP4 may be protective for endothelial barriers . Although PGE2 induces cell growth in CaCo-2 cells, PGE2 has been also shown to cause disruption of a CaCo-2 cell barrier that involves EP1/EP4 activity supporting our observation that EP4 agonism decreases esophageal epithelial cell barrier [42, 43]. In summary, we show that surface expression of EP2 and EP4 receptors is decreased in blood eosinophils of EoE patients relative to healthy subjects. Among EP receptors, EP4 is the most expressed in esophageal mucosal biopsies of EoE patients. Since EP4 agonists inhibit cell migration, and EP4 and EP2 agonists decrease adhesion of eosinophils to the squamous esophageal epithelial cells, the low surface expression of eosinophilic EP4 and EP2 receptors could have an impact on the influx of eosinophils into the mucosa. However, EP4 and EP2 in esophageal epithelial cells could lower the epithelial barrier integrity which is counterproductive in EoE. Open access funding provided by Medical University of Graz. The authors wish to thank Iris Red for excellent technical support. RS, CH, FD, AE, and EMS designed the study and supervised the work. FD, AE, and CH collected the patient samples and provided the clinical data. EMS performed flow cytometric experiments. VP performed all other assays (qPCR, migration, adhesion, barrier assay). CL made the histological diagnosis of EOE and provided the histological tissue. MG performed the immunohistochemical studies. EMS, VP, and RS analyzed all the results and performed the statistical analyses. RS, EMS, VP, MG, FD, CH, and AE wrote the manuscript. All authors were involved in data discussion and critical reviewing of the manuscript. This work was supported by the Austrian Science Fund (FWF Grants P30144 and KLI521 to RS). Ethical approval was granted by the ethics committee of the Medical University of Graz (protocol numbers EK 28-492 ex 15/16 and EK 17-291 ex 05/06. All procedures performed in studies involving human participants were in accordance with the ethical standards of the institutional and/or national research committee and with the 1964 Helsinki Declaration and its later amendments or comparable ethical standards.